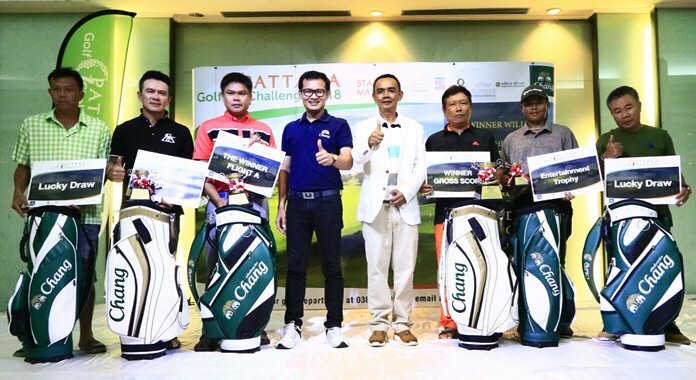 The six winners of the Pattana Golf Challenge 2018 pose for a group photo. The final round of the Pattana Golf Challenge 2018 took place at the end of September, with 6 golfers now confirmed on the trip to play the Bluffs Ho Tram in Vietnam. The low gross winner of this year’s Challenge was Khun Kitti Sitthiprawate while flight victories went to Pittaya Treepop (A Flight) and Kanon Saithong (B Flight). The Entertainment Trophy was won by Polkrit Phavichai while those qualifying via the lucky draw were Theeraporn Kaewwongsa and Sakda Thongcharoenpanich.